SpeedPro Imaging, the nation’s leading printing and graphics franchise, is embracing its role as the industry’s technology leader with the inclusion of the HP FB550 UV Flatbed printer in the newly updated and more robust franchise startup package. As the market leader in large format imagery, SpeedPro Imaging has the knowledge, vision, and foresight to adopt technological advances aimed at boosting quality, efficiency and overall customer satisfaction before others. 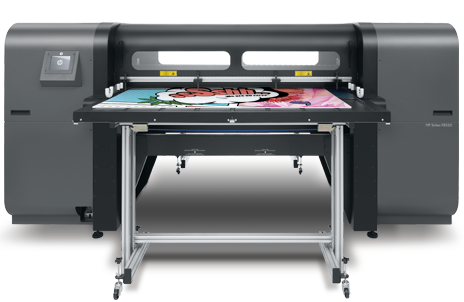 Increased Efficiency – This large-format printer enables studio owners to load, print, and collect media simultaneously, allowing a continuous workflow, saving both time and money. Reduced Labor and Material Costs – Rigid materials are no longer a cause of concern with this HP UV flatbed printer. Your local SpeedPro Imaging Studio can print directly to your rigid and flexible substrates, eliminating the need for two materials and eliminating the additional labor involved. Unique Product Opportunities – SpeedPro Imaging studio owners can print on a wide range of substrates. Aluminum, wood, glass, mirror or acrylic, anything up to 2.25” thick, are possibilities. That opens up more options to provide a variety of high-quality large-format printing applications for wall murals, event graphics, and window graphics. The printer allows your local SpeedPro franchisee to even take a door off its hinges and run it right through!